Things have been ticking along running wise for the last month or so. 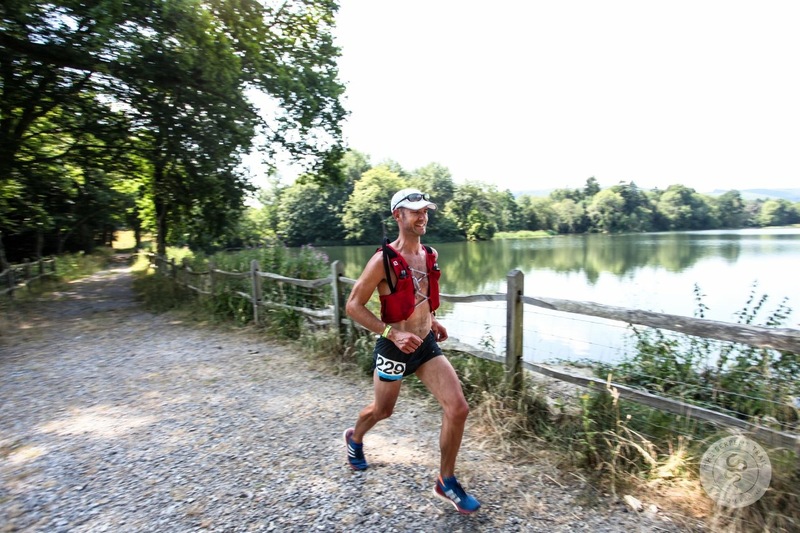 My plans for this summer were to generally chill out, do more trail running and do the odd ultra distance race… Looking forward to the autumn I’ve got my eye on a 2nd marathon, which will probably be Bournemouth in early October. It was going to be the York marathon, but a overseas work trip rendered that option unviable. Bournemouth should have the advantage of being a qualifying event for the 2019 England Age Group (Masters) Marathon Championships, this is still TBC but has been the case last year and this year. It’s also very close to home, so easy for race-day! But back to this summer, which has been quite warm…. 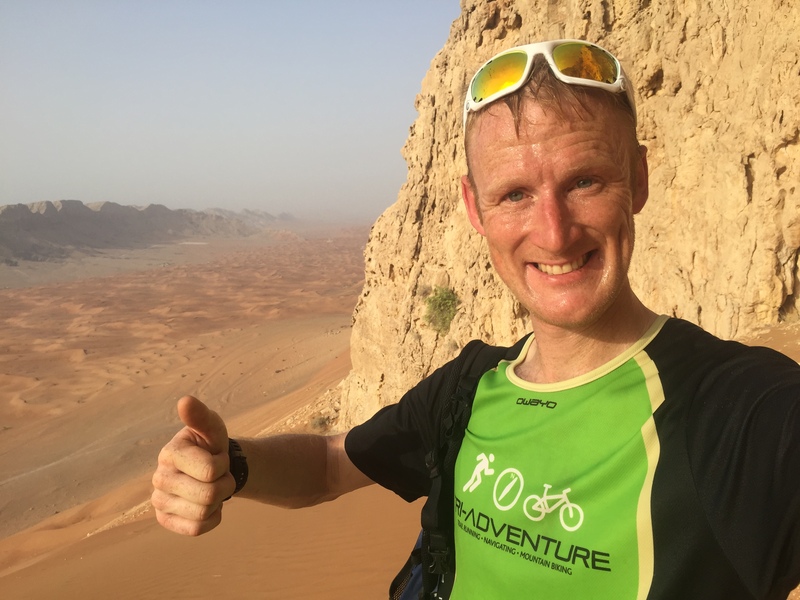 Post London marathon I had my eye on doing some longer off-road racing to get a good change of training emphasis after months of tarmac bashing in the spring. I’ve run the 50km race of the Salisbury 5-4-3-2-1 event a couple of times in the past and that was definitely on the cards in mid-August. Then via Alton Sports I’d found out about the Serpent Trail Races organised by Freedom Racing. 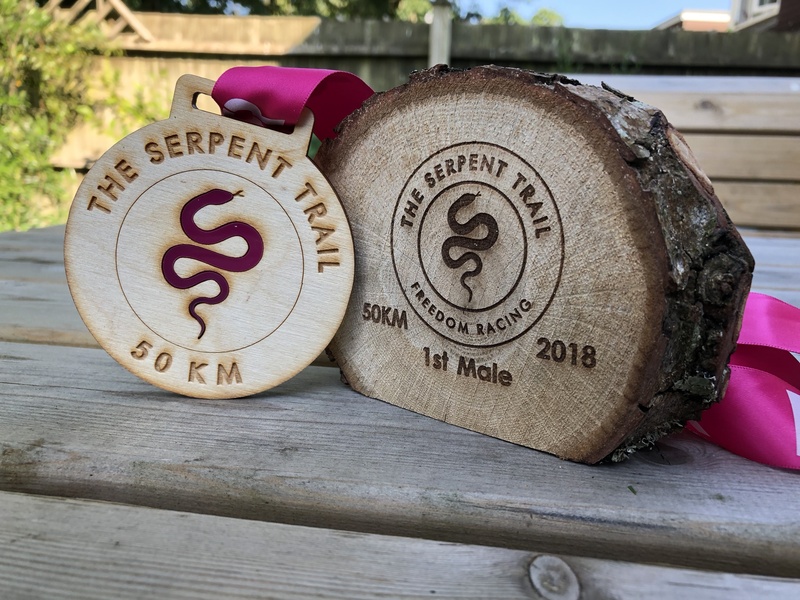 The races are based on the Serpent Trail, a long distance footpath on the South Downs in West Sussex which ‘snakes’ it’s way from Haslemere to Petersfield via Petworth and Midhurst. Freedom Racing organise a 100k race which does the full length of the footpath, a 50k starting halfway in Petworth, a half marathon starting near Midhurst and then a 10k on the final stretch into Petersfield. I considered the 100k option but decided instead to go for the 50k to see what level of fitness/endurance I would have ahead of doing the Salisbury 50k five weeks later. The Serpent Trail 50k is billed as relatively fast and not too hilly, with the only major ascent with the first couple of miles. After that the course does undulate but nothing particularly taxing. Given the weather forecast the jacket and space blanket did seem a bit excessive, but with a final cut-off set at midnight (from a 10am start) some people could be out on the course well into the night so some protection in case of emergency could be a life saver. 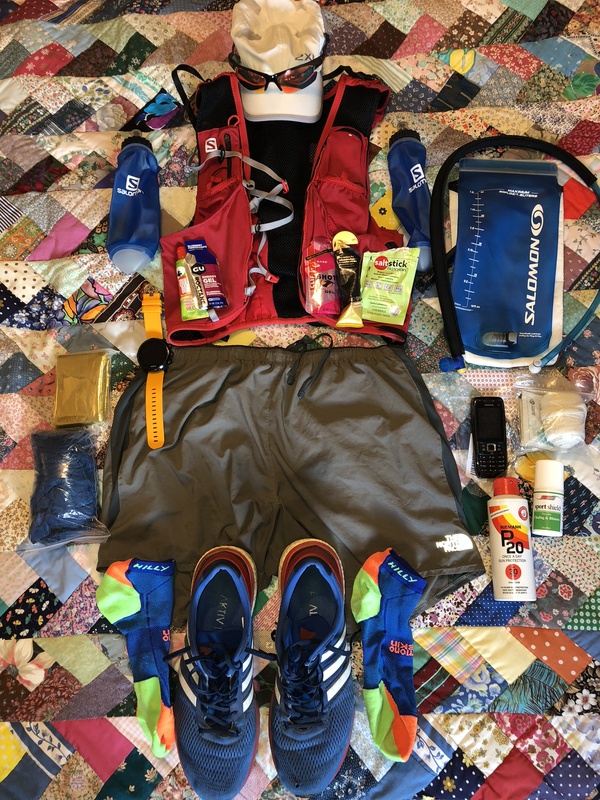 I’d practiced running in hot conditions without any top on under the Salomon technical vest in my long run-commutes (see below) so i knew this would likely be ok for the race. Although I did coat my shoulders in plenty of Sport Shield silicon anti-chafe. Mizuno race shorts were picked for comfort and lightweight. As the ground conditions were hard and dry I went with my Adidas Boston Boost road shoes. There were a few stretches of tarmac in the 2nd half of the race, so I figured it was going to be better to be comfortable for those bits and put up with the odd slip or loss of traction on the looser sections of trails. My kit was rounded off with a white cap (sun reflection!) shades, sunscreen and a packet of Saltstick Fastchew electroloyte tablets. The tablets turned out to be very useful! 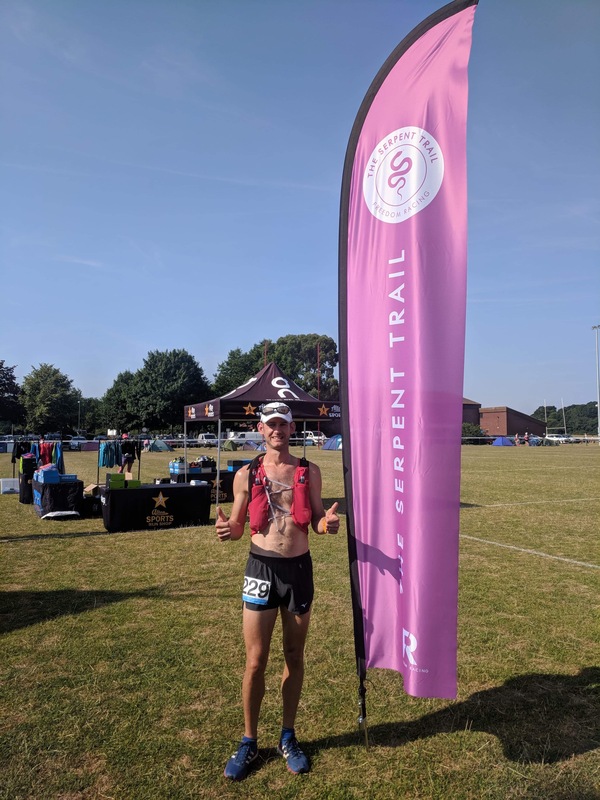 Since the Endure24 weekend in June I’ve been running pretty much normally averaging between 60 to 80 miles a week mostly easy runs, with a few short races including; a couple of RR10 cross countries, the Sway 5 mile race and the odd parkrun. On a side note it was the 1st time I’d run the Sway race since I ran it as my first ever race 8 years ago in 2010, back then I was 104th in 41:46. Fast forward to 2018 and I did a little better coming 2nd in just under 30 minutes! I had hoped to in with a shout of the win, but the combination of an over enthusiastic run on the Friday before and an in-form friend Adam meant it didn’t happen! Aside from the racing the only other ‘interesting’ runs I did were a series of morning run-commutes in across the New Forest from home near Lymington to my work in Eastleigh. To start off I got as far as Ashhurst railway station (about 14 miles), but the next week managed to push myself the full distance (just over a marathon) after getting to Totton station to find that there was a 30 minute wait for the next train so decided to crack on with the final 7-8 miles across Southampton. The next week I did the full distance again on foot, but this time via the Hythe Ferry and up the River Itchen. Normally cross-Forest running requires a detailed knowledge of which bits are dry and where the bogs are, which usually limits route choices going towards Hythe/Marchwood. However the total lack of rain in the past weeks means the Forest is bone dry and you can run almost anywhere you want in the open areas! Anyway, back to the Serpent Trail…. 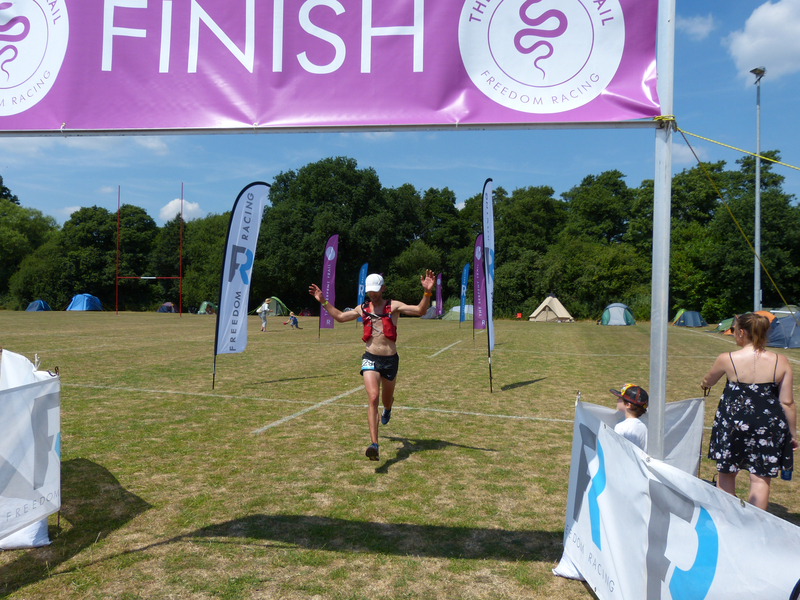 The race was held on Saturday 7th July with registration at Petersfield Rugby Club (the finish) and then the competitors get bussed to the start just outside Petworth. When I arrived Scott from Alton Sports was busy unloading his van, I gave him a hand while we chatted about the race and stuff. Then it was time to register and get my gear on. The start was at 10am and the day was already heating up before we boarded the buses for the 45min drive to the start. The start was a small strip of grass along the road where the coaches parked up. We weren’t there for long, a quick race briefing from Tom the Race Director and we were off down the road for about 100 yards and the right straight up the biggest hill of the whole race! With no idea about the rest of the field I just struck out at a comfortable pace and waited to see who did what. After about half a mile of running on my own at the front another runner came up alongside me. This was Floyd Ratciffe who had come up from Cornwall to do the race (the race organisers are from down that way). We chatted for a mile or two before I started to pull in front and settled into watching out for trail markers, which was a circular disc with a purple arrow containing a snake pointing in the direction of the trail. In addition there were extra course markers placed for the race. The temperature in the first hour or so of the race felt quite manageable, helped by decent sections of the course being in the shade of trees. However where we came out into the open in was clear the sun was going to be very hot. The temperature was easier over 30DegC and there were a few parts which ran across open sandy heathland where it felt really baking, which combined with the tendency for these parts to be sandy as well made for hard going, By the time I got to checkpoint three at 31k I’d finished the water in my soft flasks, although I still had a reasonable amount in my back bladder, and had had several periods where I’d seriously wondered if I was going to make it to the finish. I stopped at the checkpoint (SW of Midhurst) which was the first CP on the half marathon route as well. I doused myself with water (including dunking my cap), refilled the flasks and had some Coke. Setting off again I felt a bit revived and now had some company while running as I caught up with the back of the Half Marathon field. The other thing that really seemed to be helping was eating Saltstick Fastchews, which are a chewable tablet that is formulated to closely resemble the electrolyte profile lost in sweat with; sodium, potassium, calcium and magnesium. The recommended intake is 1-2 per hour for running, so I figured a pack of 10 would be fine for the 50k. These tablets turned out to be a bit of a revolation… I starting taking them early on the race and in the mid to latter stages I reckoned I could really feel the difference in my legs after taking one! Although they are quite salty to taste they have a pleasant lemon-lime flavouring which covers the saltiness pretty well. The last 10 miles from CP 3 to the finish was very hard work, to the point which I had to slow to a fast(ish) walk in places. I think this was due to the combination of the external temperature and the heat generated by me internally gradually causing my muscles to seize up. I didn’t cramp up thankfully, but the resistance in my legs got worse and worse. I continued to reel in the half race runners, although as I worked my way up through the field increasingly I was exchanging run/walk sections with them. The final CP (no.5) was around 5k from the finish and there was no sign of any other 50k runners behind me. I took a decent stop for a final cool down and drink. I didn’t have anything to eat at the CPs, having brought a couple of my own gels to carry, but there was a nice range of fruit and other snacks available at each one. The last stretch involved a couple of sections running along through the middle of cornfields before hitting the last section of road into the outskirts of Petersfield. the course finished running along a nice wooded path (which seem to go on forever!) and up onto the pitch of the Rugby club. I was loudly welcomed into the finish by my family, crossing the line in 1st (and a new course record) in a little over 4hrs 10mins. Overall it was a great race, the course is generally very interesting, with not too much road running involved and some lovely woodland singletrack trail sections. The organisation by Freedom Racing was great and very smooth. It definitely ranks as one of the hardest races I’ve ever done but that was purely down to the weather conditions on the day. I highly recommend giving it (or the 100k, half marathon or 10k!) a go. More details can be found here. You can follow Al’s running achievements on Strava / Instagram / Twitter. 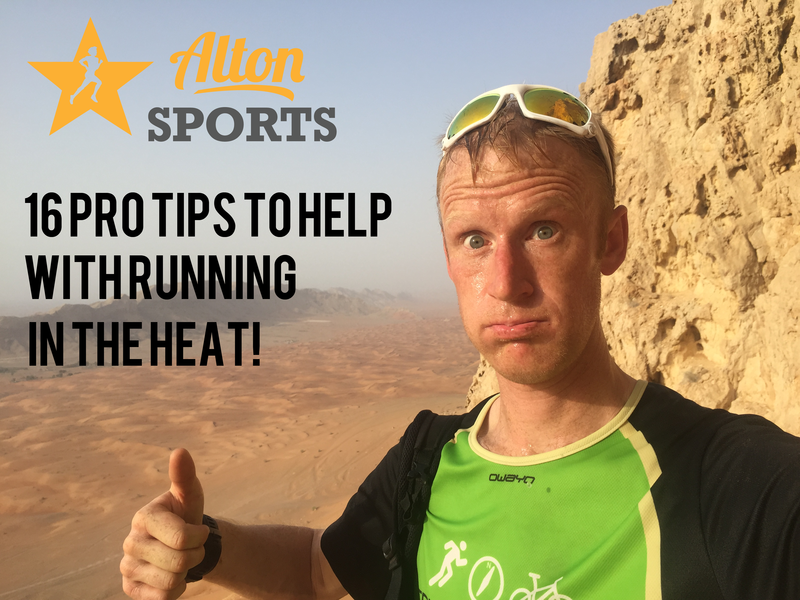 Alton Sports Ambassador, Adam, has very kindly put together all these pro-tips for running in the heat! With the cold Wintery weather that the ‘Beast from the East’ brought in now a distant memory, I’m sure we have all been making the most of this glorious recent hot sunny weather. We find ourselves amongst so much inspiring national sport at the moment; what we can’t allow is for the hot weather we have been experiencing to put a stop to our training when we have plans and targets in place. Sometimes, it is best to use your head and adapt your sessions/efforts accordingly. Think about heading out earlier, perhaps set your alarm and complete your run early in the morning before it gets too hot. Plan your route to pass water supply points such as shops or petrol stations. This will allow you to remain light weight on your run and maintain hydration at periodic stops. Alternatively, you will need to carry water on the run. A specifically designed running vest pack such as these options will allow you to carry water which is easily accessible on your chest. Alternatively, a rucksack with a hydration system bladder will also work. While out on your run, it is best to drink fluids little and often, as opposed to large gulps, as this will allow your body to absorb the liquid you take on effectively. Wear light fitting clothing to allow the air to circulate about you while you run. This will help you to dissipate your body heat. Look where the sun will be on your run and perhaps choose a route in the shade. This may see you heading to the woods, through a forest or an out and back along a shady stream or canal. Run next to a body of water such as a lake or a canal, as these can be quite cooling, or run by the sea, as local sea breezes will help keep you cool. 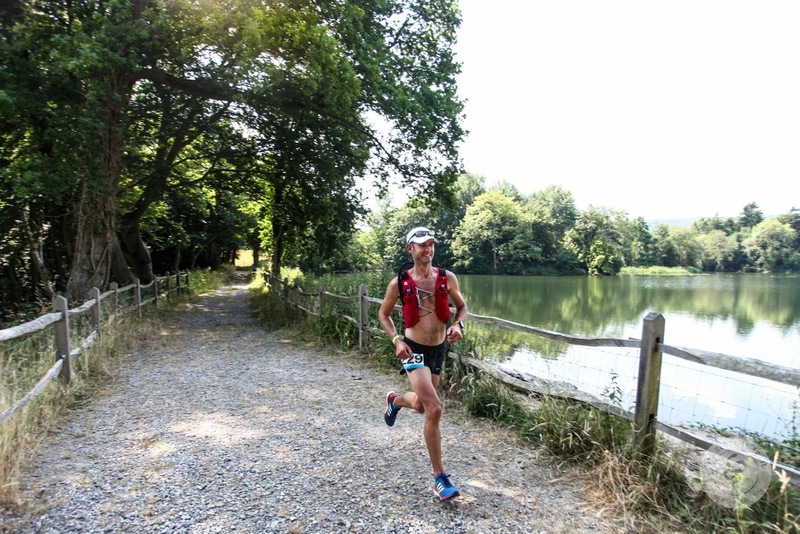 You may want to minimise your exertion in the heat by selecting a flat route to run along, as opposed to tackling those hills and raising your temperature. Hit the trails for a change. If it is hot, then it is likely that there will be little mud about, so take your road runners off road. Sun baked tarmac can radiate a lot of heat, making it especially tough going over a prolonged period. When we run in the heat, our bodies try to cool themselves by producing sweat. The body then cools as the sweat evaporates from our skin. The trouble is that as we run, a lot of this sweat forms drops and falls off, therefore not offering the cooling intended. As a result, the body produces more sweat and this is why it is important to replenish the fluid we lose through sweat as we exercise. When running in the heat, it is also important to replenish your salt levels as these are reduced through the sweat you produce. I will always run with sports salt tablets, available from the Alton Sports shop. When your salt levels drop, you are susceptible to painful cramps and a drop in your efficiency. The potassium in bananas is not enough to relieve this. Do check the guidelines, but I would consume one tablet every hour with some water while out running in the heat. You may want to consider increasing this if your run efforts are making you particularly sweaty. If racing on a hot day, make sure you are well hydrated well in advance of your event, starting the night before. You should not feel thirsty on the start line and your lips should be nice and moist. A drop of just 5% in your body’s hydration level can lead to dramatic effects on your performance and efficiency. It is likely that you will sweat out more moisture that you can absorb through the fluids you take on. This will lead to dehydration over time. It is important to drink plenty of fluids after you have finished your run as dehydration can delay your recovery. With heat, often comes the Sun! Wear sun cream on your exposed skin to avoid burning yourself. Wear a hat and soak it in water. A peaked cap will keep the sun out of your eyes. By soaking your hat in water, the evaporation of the water while on your head will cool you down. Blisters on your feet – these are caused by heat and friction, so there is an increased chance of a blister developing in hot conditions. The movement of your feet within your shoes can cause irritations and blisters. So, make sure your trainers are securely fastened to minimise movement. Tend to any hotspots that may develop immediately to avoid further discomfort. Be aware that if you pour water over yourself during a run resulting in your feet getting damp, this will also increase the likelihood of blisters. Enjoy your time running in the heat. Don’t let it stop you or take the enjoyment away from your running. It is always a good idea to expose your body to these warm conditions as you never know what you may experience on a race day. It does take time for your body to get used to operating in the heat, and this may take some longer than others to adapt. Check out some hydration packs here.